Andy Murray is no stranger to the semi-finals of a Grand Slam but he went into his quarter-final with David Ferrer knowing that a win would make history for British tennis. Johanna Konta had already booked her place in the semi-finals of the women’s draw following a 6-4 6-1 win over China’s Zhang Shuai. Meaning a win for Murray would mean British would have two singles semi-finalist for the first since 1977. Murray didn’t disappoint the British tennis fans as he beat Spaniard Ferrer in four sets. The achievement by Murray and Konta equals that of Sue Barker and John Lloyd, who reached the last four of the Australian Open 39 years ago. 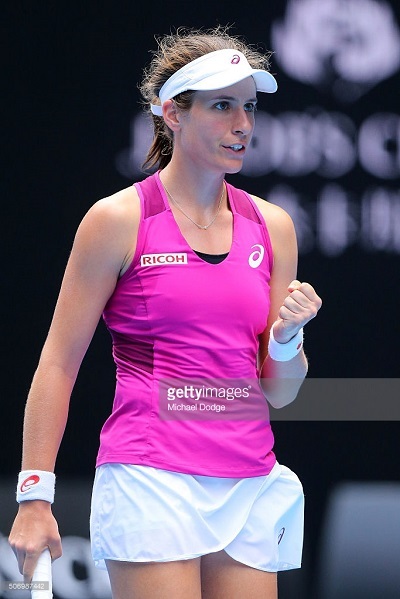 Konta will be hoping to do better than Barker, who was knocked out in the semi-finals. Whilst Lloyd fell at the final hurdle in 1977 to finish runner-up. Konta is currently ranked 47th and her run to the semi-finals are likely to see her secure a place in the top 30 of the women’s rankings. Though she won’t be settling for what she has achieved so far and will be looking to make the final when she faces seventh seed Angelique Kerber. The German overcame Victoria Azarenka in the semis. The semi-final will take place in the early hours of Thursday morning, UK time. With an estimated start time of 4:30am GMT. Murray will play either Milos Raonic for a place in the final, after the Canadian defeated Gael Monfils. Murray currently ranked as the second the best player in men’s tennis, will have his sights set on adding to his two Grand Slam career titles. Murray’s main focus in 2015 was to help Great Britain win the Davis Cup and will now be concentrating on challenging Novak Djokovic for the number one spot in the rankings. Andy’s brother Jamie was also celebrating today as he won through to the semi-finals of the doubles with partner Bruno Soares. Making it the first that two brothers have made the semi-finals in singles and doubles draws of the Australian Open.